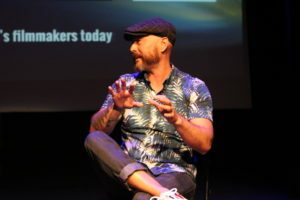 Matt K. Turner at Film Invasion Los Angeles 2018. Matt K. Turner wrote, produced and directed RFLKTR. This sci-fi masterpiece starring Breeda Wool took home a Grand Jury Prize at Film Invasion Los Angeles in 2018. RFLKTR is a visually stunning film with an airtight, world-building screenplay and a brilliant acting performance. If you manage to watch it with a great audio system you’ll notice that the sound design is at a level you never hear with an indie film. In fact, it even features some terrific costume design. But guess what? You don’t get to see it yet. Sorry. Matt is holding onto it for the time being. For now you’ll have to settle for the still photo below. Even though I knew that Matt didn’t have plans to release the short anytime soon, I wanted to bring him on the podcast. At the Film Invasion Los Angeles Q&A we got to learn a little about Matt’s history, but it left me wanting to know more. After all, he made such a great film and there’s a lot that other filmmakers can learn from him. Spoiler alert: one of the most important things young filmmakers can learn from Matt K. Turner is PATIENCE. Enjoy the interview and check out this still photo. Still photo from RFLKTR. Grand Jury Prize winner for Best Short at Film Invasion Los Angeles in 2018.